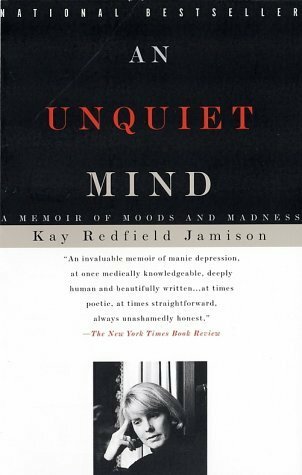 In her bold autobiography An Unquiet Mind, Kay Redfield Jamison details her struggle with bipolar disorder in the midst of her career as a clinical psychologist. First published in 1994, this book highlights Jamison’s bravery: with such a prestigious academic position and a CV full of work related to manic-depressive disorder, she risked her reputation and her ethos by writing this wonderful, heart-wrenching volume. The Chinese believe that before you can conquer a beast you first must make it beautiful. In some strange way, I tried to do that with manic-depressive illness. It has been a fascinating, albeit deadly, enemy and companion; I have found it to be seductively complicated, a distillation both of what is finest in our natures, and of what is most dangerous. In order to contend with it, I first had to know it in all of its moods and infinite disguises, understand its real and imagined powers. Jamison reveals everything in An Unquiet Mind. She shares her family history, her scholarly successes, her romantic relationships, and how her bipolar disorder affected all of those facets in her life. Her writing, while full of emotion, maintains a professionalism and intelligence that never speaks down to the reader. Jamison has gone through many trials in her life, and though reading this book forces us to feel along with her, she adds words of wisdom and hope along the way. But, ineffably, psychotherapy heals. It makes some sense of the confusion, reins in the terrifying thoughts and feelings, returns some control and hope and possibility of learning from it all. Pills cannot, do not, ease one back into reality; they only bring one back headlong, careening, and faster than can be endured at times. Psychotherapy is a sanctuary; it is a battleground; it is a place I have been psychotic, neurotic, elated, confused, and despairing beyond belief. But, always, it is where I have believed – or have learned to believe – that I might someday be able to contend with all of this. The inspirational quality of An Unquiet Mind makes it a marvelous read. Even though Jamison contended with manic-depressive illness for several of the most important years of her life, she still earned success and acclaim. Her accomplishments speak to how mental illness should not be construed as a crutch that will inevitably handicap all those affected by it. Jamison also dispels the rumor that medicine will numb one’s mind. She admits that taking lithium played a key part in her recovery, and while taking lithium, she worked and wrote and saw patients. Jamison acknowledges the stigma against mental illness, and she shows how she overcame it through her passion and dedication to the field of mental health. Overall, highly recommended for those searching for a book about bipolar disorder or mental health in general. Powerful and honest writing sets An Unquiet Mind apart from other books, and I look forward to reading more of Jamison’s works. This book sounds really interesting and inspirational. Thanks for sharing your thoughts – I’ve added it to my list to read! 100% interesting and inspirational. Glad you’ve added it to your to-read list, please let me know what you think if/when you read it! It sounds like a good idea to read this Thomas. In my line of work we deal with a lot of folks with bipolar diagnosis. Maybe it would help with understanding and insight. I agree that this book builds empathy. Hope you enjoy it if you check it out! This book has been in my TBR list since like forever. Gah. Btw, I really recommend Andrew Solomon’s ‘The Noonday Demon: An Atlas of Depression’. Ah, is there anything in particular that’s prevented you from checking it out (or is it just that you haven’t gotten to it yet)? And thank you for the recommendation of The Noonday Demon – I put it on my to-read list after watching Andrew Solomon’s affecting TED Talk, and I just moved it up due to your praise. Can’t wait to read it! Nothing in particular. It’s just that I tend to be like a puppy when it comes to books. I get so easily distracted by shiny pretty things. Like, ‘Ooh, a new Discworld novel!’ or ‘I think I want to re-read The Lord of the Rings’. Hence the TBR list only gets longer and longer. Sometimes I even read three books simultaneously. It’s a bad habit. ‘The Noonday Demon’ is fascinating. I think Solomon is a pretty good writer. Some people might not be able to really relate to him because he’s quite privileged, but I think no matter who you are, the intrinsic nature of depression is still the same. It’s still debilitating, destructive and scary as hell. I think you’ll like the book.